(Leah Hogsten | The Salt Lake Tribune) "Utah needs a comprehensive and holistic approach to address this deadly plague and the answer is found within grass-roots coalitions formed between law enforcement, the medical, treatment, and recovery communities to collectively share resources and attach the problem in unison." said Utah DEA agent Brian Besser. The Drug Enforcement Agency unveiled a new strategy to combat opioid abuse. The DEA 360 Strategy will be a comprehensive approach involving law enforcement, drug manufacturers, doctors, pharmacists and educational programs for schools and social media platforms. In an effort to combat heroin use and prescription drug abuse in Utah, state officials called for more aggressive law enforcement for drug traffickers and more compassion for addicted users as they announced the launch of a new program: DEA 360. Representatives from state agencies and community organizations joined the Drug Enforcement Administration to announce the program’s launch Wednesday morning at the Sugar House Boys and Girls Club. The strategy calls for aggressive law enforcement, educational programs and a partnership with the medical community to avoid patients getting addicted to prescription drugs. Much of what the DEA 360 program will focus on are efforts that already exist in Utah, according to Attorney General Sean Reyes. But those efforts are underfunded and under-recognized, he said. DEA 360 will bring in resources to prosecute, as well as strengthen coordination between community groups and law enforcement. The DEA brought in the yearlong program, but it will involve representatives from various Utah agencies and community organizations to shape the program into something Utah-specific. They’ll come up with advertising campaigns to change public attitudes and perceptions of heroin and prescription drugs. Officials want to curb drug usage by driving up prices; limiting availability to heroin and prescription drugs; and increasing the risks involved in trafficking drugs by imposing harsher sentencing. Agents will prioritize arresting drug traffickers over users, according to DEA Special Agent in Charge Brian Besser. Besser said he is working with legislators to propose bills related to opioid abuse and heroin use. He declined to comment on which lawmakers or the specifics of the measures he wants to see. Reyes told a Salt Lake Tribune reporter he would like laws that make it easier for prosecutors to convict traffickers. 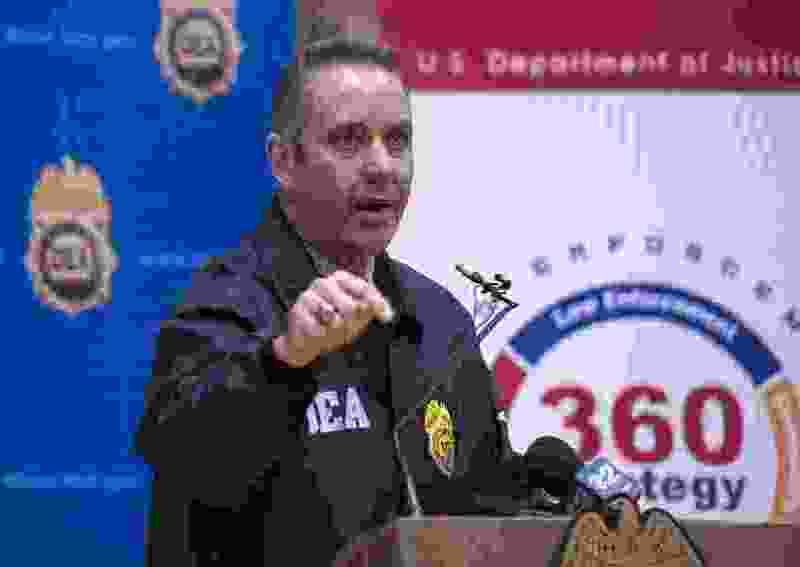 The resources brought in by DEA 360 will give prosecutors “the teeth we need to go after cartels and drug dealers,” and divert those addicted away from penitentiaries to treatment programs, Reyes said. People who are addicted, he said, are victims. He and other officials with the Department of Public Safety (DPS) and the U.S. attorney’s office said that their preference is to work with those addressing their addiction to keep them out of prison. DPS officers would rather refer those addicted to drugs to treatment instead of taking them to jail, DPS Commissioner Keith Squires said. The resources from DEA 360 give officers more flexibility to decide if an individual user “needs help more than he needs to be arrested” for possession of a controlled substance. “Compassion, understanding and actual resources for those who are victims, who are addicts and need that cycle of addiction broken,” Reyes said. Reyes said he has worked with insurance companies to prevent opioid addiction. He wants insurance companies to expand coverage to low-cost drugs that are less addictive, as well as holistic recovery alternatives. He said he is working with pharmacies to dole out fewer amounts of opioids. Officials also want to partner with medical professionals to prevent overprescribing. Reyes said he would like to be able to prosecute doctors who knowingly and regularly put patients at risk of addiction because of greed. ”We can’t arrest our way out of this,” Besser said, adding that there is an education component as well. The DEA will launch social media and advertising campaigns, and plan outreach community events, in an effort to change attitudes toward heroin and prescription drugs. Utah becomes the ninth pilot location to host the program. And it is the first statewide use of the program, which previously has been launched in metropolitan cities. Utah was chosen after Reyes’ opioid task force asked for the federal DEA 360 grant. The DEA 360 effort lasts for one year. But after it expires, the state will devote resources to aspects of the program that work, “hopefully now with much more momentum and much more awareness,” Reyes said. The pilot program started in 2015 in Pittsburgh and three other cities. Four other cities hosted the program in 2016.